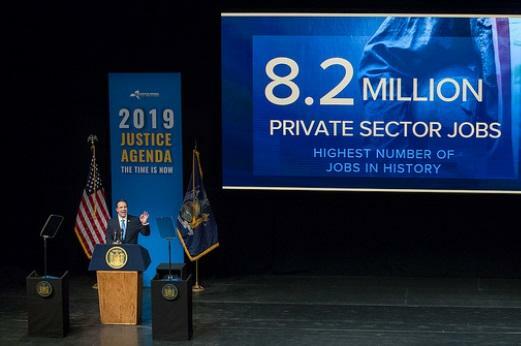 Gov Cuomo touted successes and made sweeping proposals during his State of State & Budget address Tuesday. Pro-business group Unshackle Upstate is pleased to hear about the permanent property tax cap, but worries too many tax burdens could fall on New Yorkers under Cuomo's 2019 Agenda. Some environmental groups praised Cuomo for bringin attention to issues such as climate change and renewable energy. Environmental Advocates of New York Executive Director Peter Iwanowicz says there should be consensus among state leaders. Governor Andrew Cuomo began his third term in office with a speech at the historic site of Ellis Island, where the ancestors of millions of Americans arrived as immigrants in the 19th and 20thcenturies. He focused much of his speech not on state issues, but instead on what he sees as the nation’s problems, and said New York will lead the fight against them. The state Board of Regents recommends that an additional $2.1 billion be spent on schools next year, and that a 12 year old court order to fully fund schools be phased in over a the next three years. The proposal is being applauded by school funding advocacy groups.